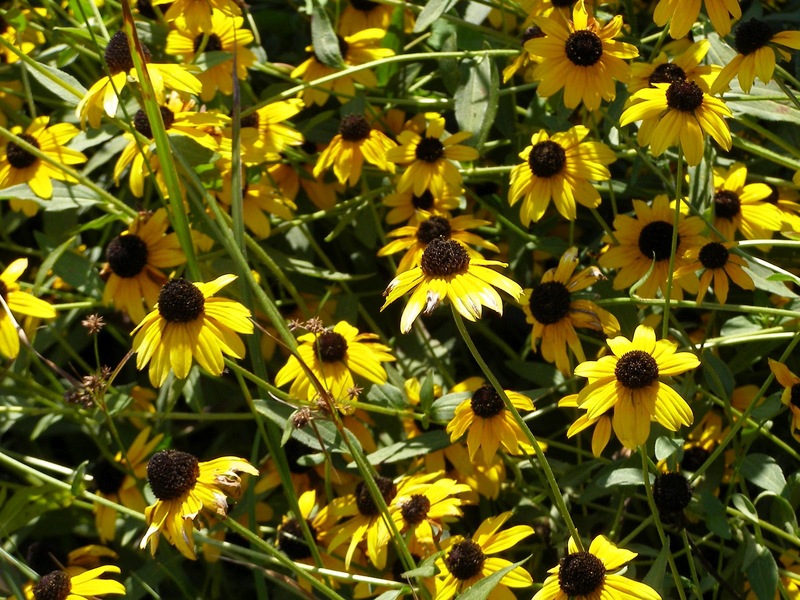 One plant that doesn’t seem much bothered by the drought is Orange Coneflower, Rudbeckia fulgida. It may appear to be a bit worn, but that’s its normal condition at this stage. 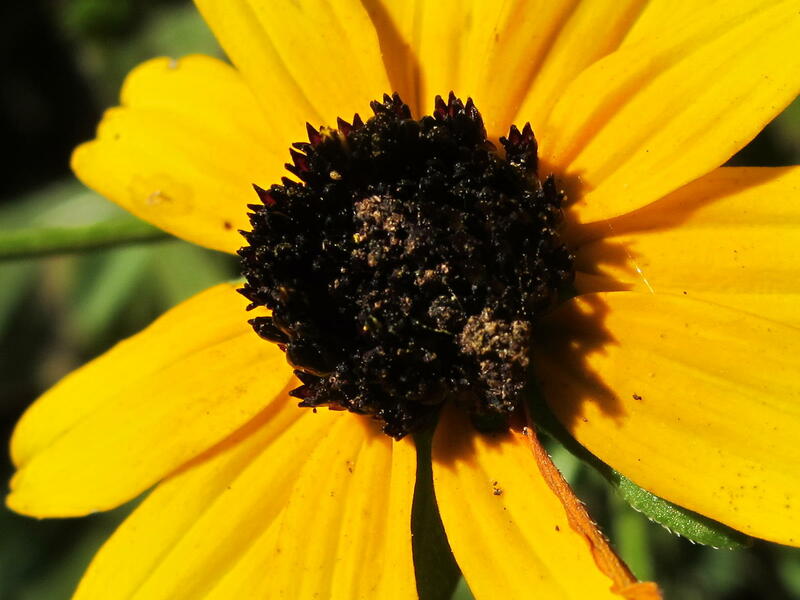 The fertile flowers are found in the central disk. The flowers mature in succession, beginning with the outer edge and moving toward the center of the disk. As blooming progresses, the disk expands upward until the center sits well above the yellow rays. Orange Coneflowers tend to grow in wetter conditions such as are found at the base of slopes or in natural drains through the field. 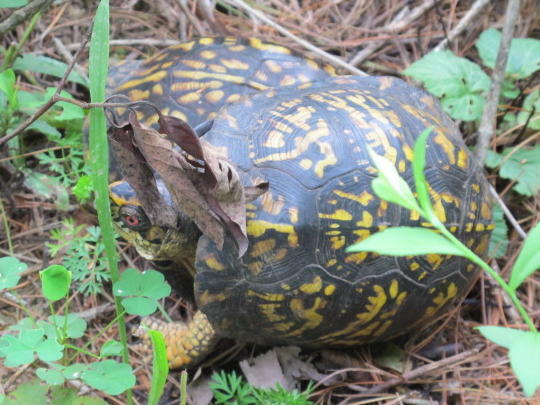 They also tolerate dry conditions. I think these two characteristics account for the plant’s vigor during this year’s unusual weather conditions. 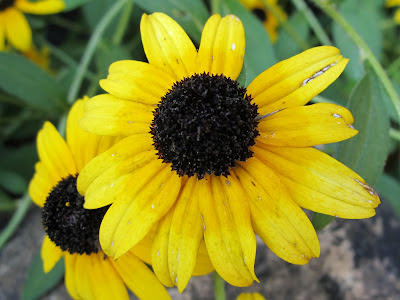 Orange Coneflowers are hardy perennials. 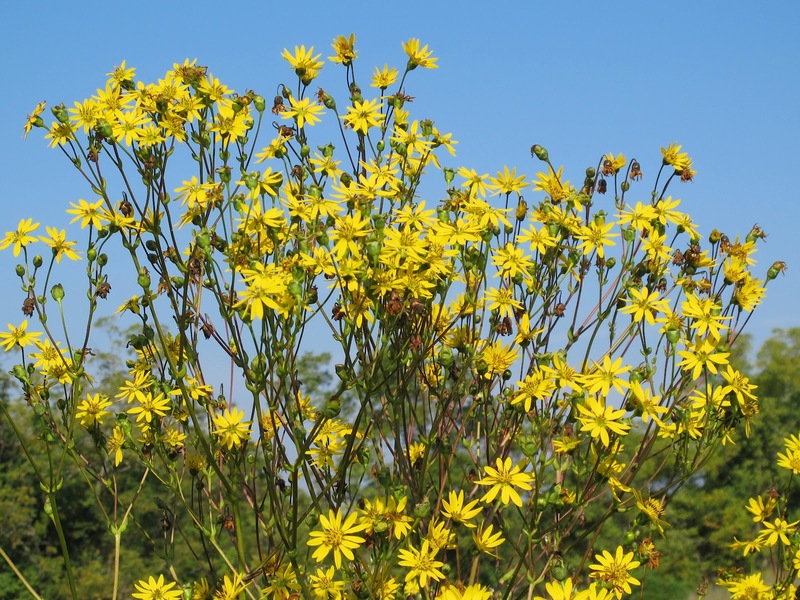 Flower stalks will die over winter. 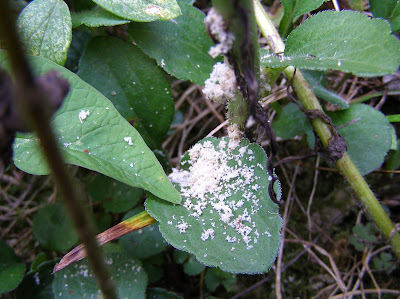 Next year’s growth will come from basal rosettes that form from short stolons produced by the flowering plant. These basal rosettes typically remain green through the winter and will develop rapidly as soon as it warms in the spring. 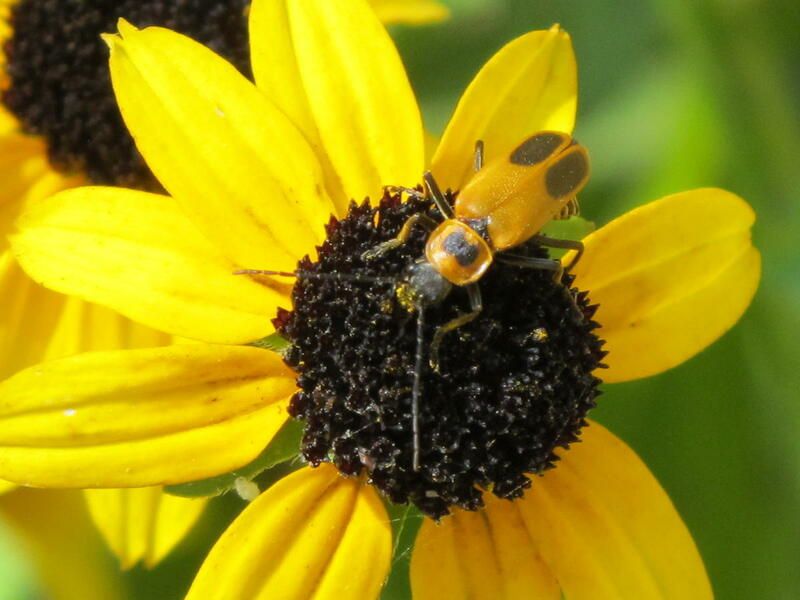 Several insect species find the Orange Coneflower of interest. An unidentified moth larva boring up the center of the stalk produces this dusty material. 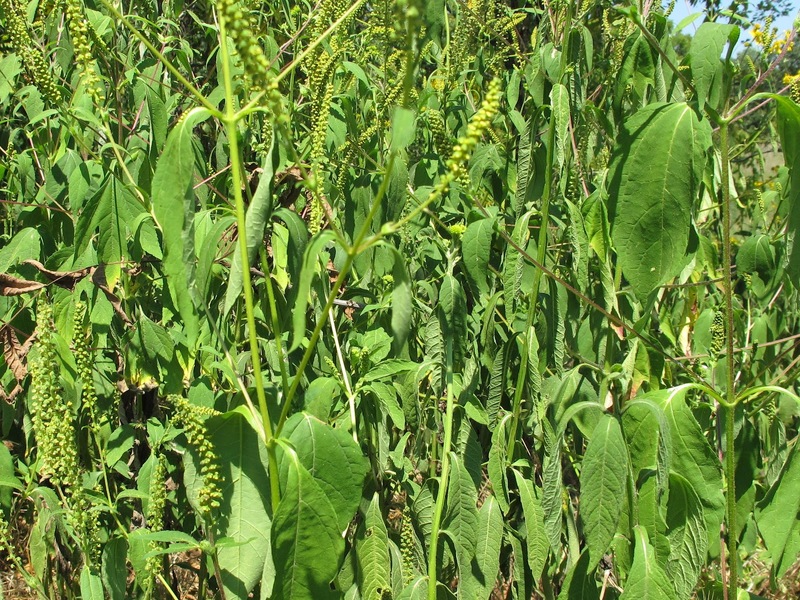 The timing of this activity doesn’t seem to affect the ability of the plant to complete flowering and produce viable seed. Over half of the plants typically contain one or more larvae. 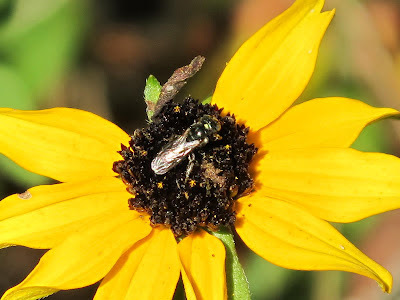 Small bees are the most numerous of the flower visitors. A few Soldier Beetles are around, but I’m seeing fewer than normal for this time of year. This neat little fly spent quite some time moving from flower to flower. 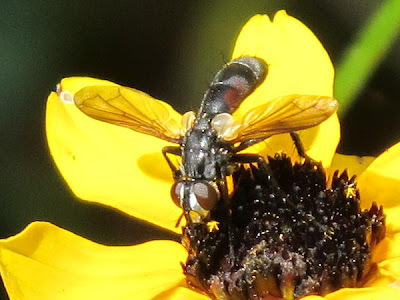 This is a member of the Tachinid Fly family, the larvae of which develop inside an insect host that ultimately does not survive the encounter. Most in that family are big, hairy brutes. This fellow is a species of Cylindromyia, a genus of wasp mimics. I don’t see these guys very often and enjoyed observing this one for the few minutes it was around. There appears to be some type of larva feeding down among the disk flowers and leaving a mass of excrement to mask its passage. 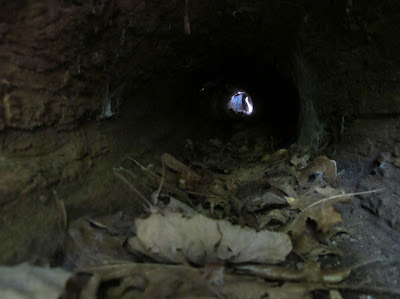 I dug into several of the affected flowers and found nothing but an empty tunnel. 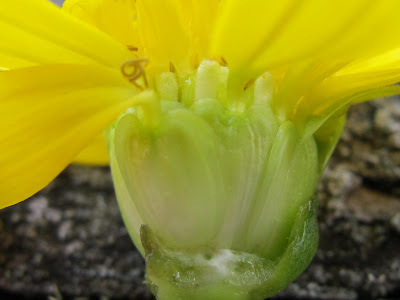 One thing noticeably absent from the flower heads was Crab Spiders. 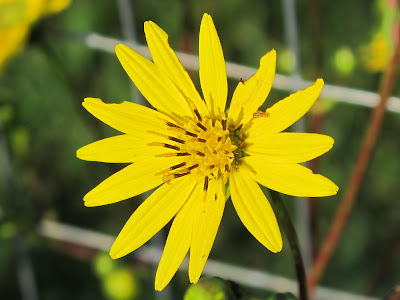 I can usually find dozens of these small yellow spiders perched on the flowers. 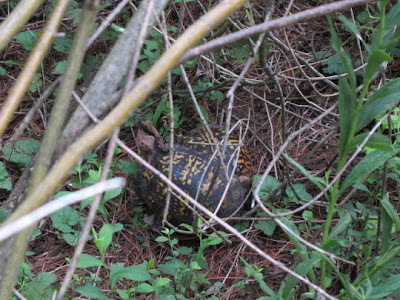 Here is one more regularly common animal species that has failed to appear this year. Weather has been a dominant force in the cycle of life at Blue Jay Barrens this year. The range of conditions from flood to drought has disrupted the ordered flow of most seasonal events. Drought continues to be the single most influential event of the year. A recurring theme across the landscape is the reduced size of most plants due to lack of moisture. Giant Ragweed is no exception, with the plants being about half their usual height. The water starved plants try to rebound overnight, but there’s too little available moisture in the soil to do the plants much good. Wilted leaves droop pathetically during the day. Perhaps the hurricane remnants will pass through and help alleviate our water deficit. Despite the dry conditions, the plants are blooming profusely. 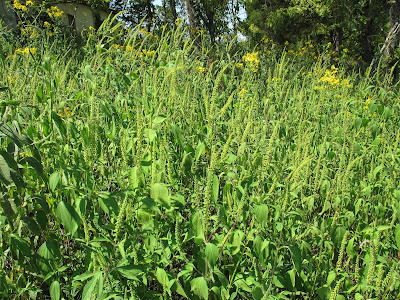 The green and yellow flowers surrounding a tall spike at the top of the plant are hardly noticeable. Giant Ragweed produces separate male and female flowers. Those flowers crowding the spike are all male and release a massive dose of airborne pollen. Hay fever sufferers would definitely not be pushing in to get a close-up of these flowers. 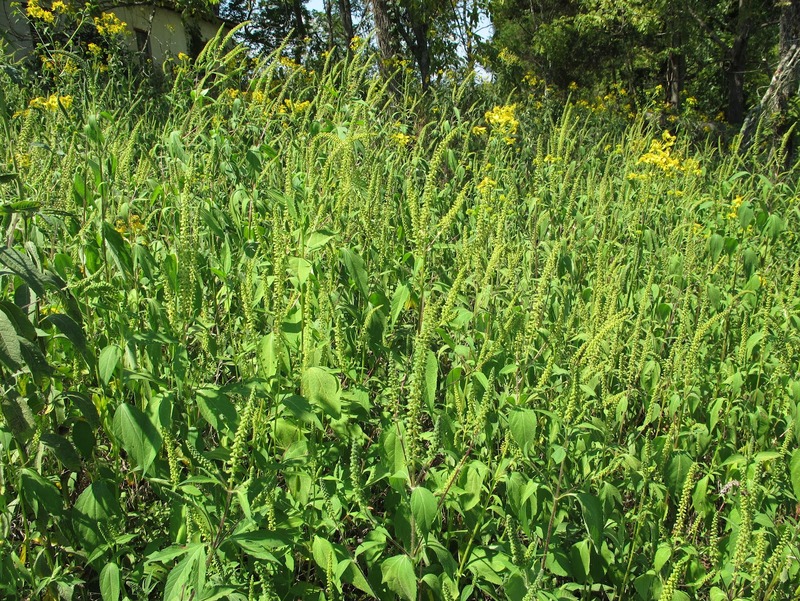 Giant Ragweed is a native annual, so the plant must produce seed to ensure a future generation. 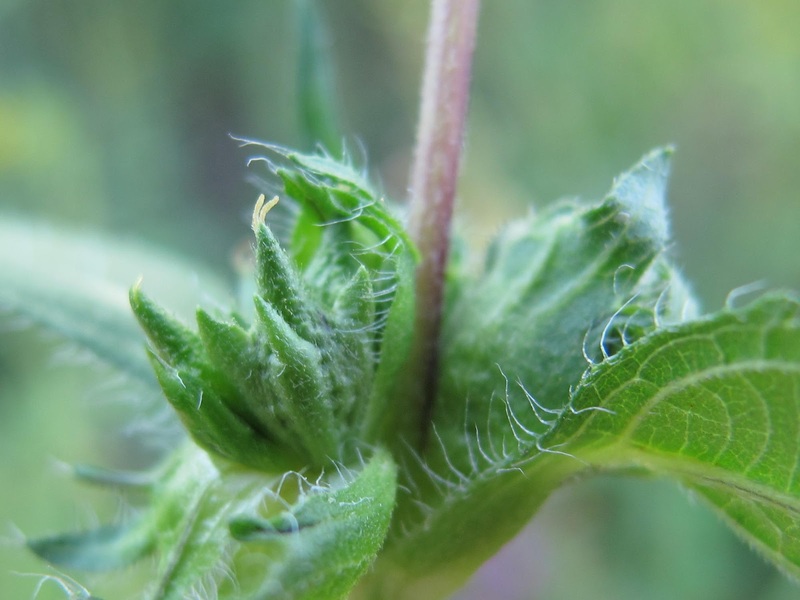 Female flowers are found concealed in leafy bracts growing from the leaf axils at the base of the flower stalk. Most people don’t even notice these well hidden flowers. 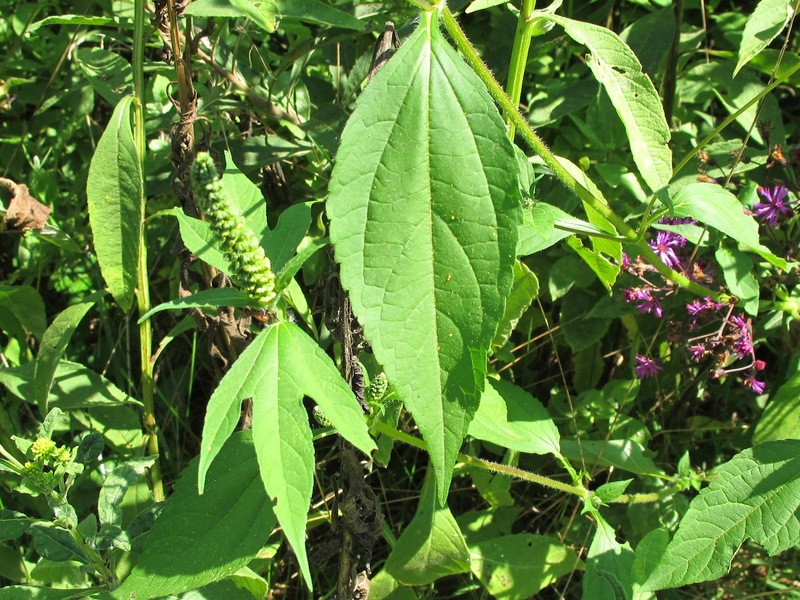 Typical Giant Ragweed leaves are three lobed like the one shown to the left above. Many of the Blue Jay Barrens population are unlobed. 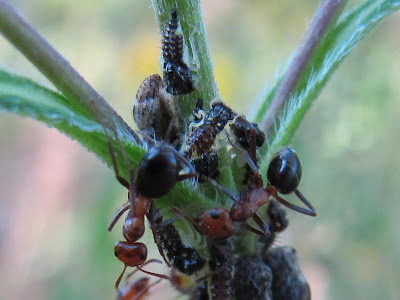 On of the most interesting features of the Giant Ragweed is the interaction between the Allegheny Mound Ants, Formica exsectoides and a Treehopper, Publilia concava. 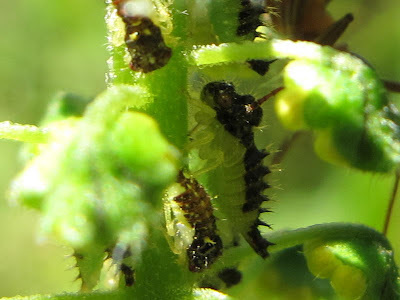 Clusters of these insects are found on almost every plant. The Treehoppers feed on ragweed sap and as a byproduct of the feeding process, produce honeydew. 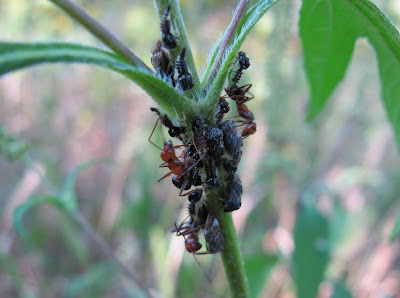 The ants feed upon the honeydew. In their efforts to protect their food supply, the ants provide security for the Treehoppers and the Giant Ragweed plant. 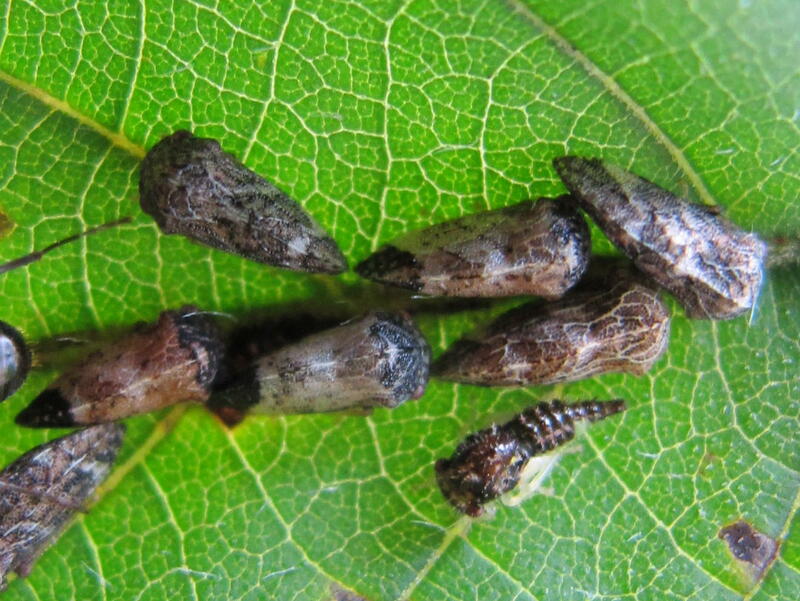 The Treehoppers are fascinating creatures. 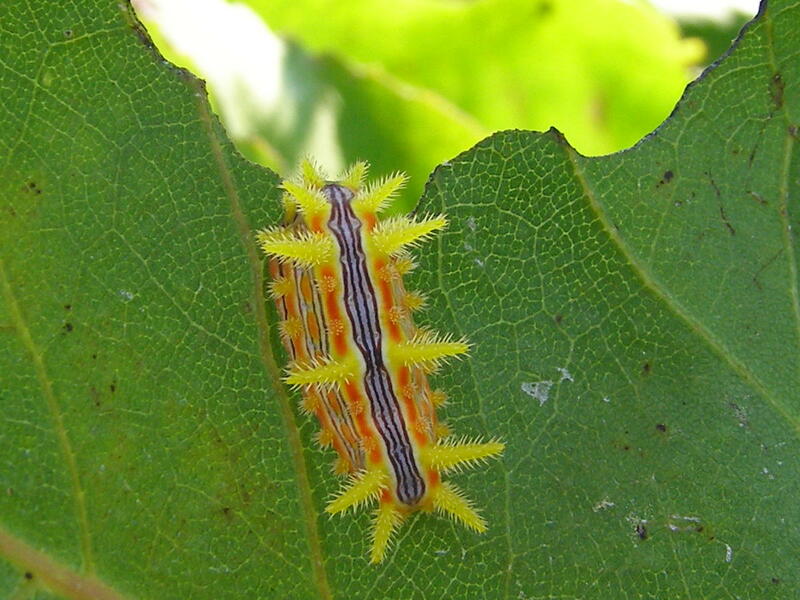 The spiky nymphs exhibit a two-tone color pattern that is variable between individuals. They certainly don’t look like something that is a likely food item. The adult Treehoppers have a smoother appearance. They stand out against the bright green of the leaf, but their wide variation in color patterns makes them appear to be a part of the plant. 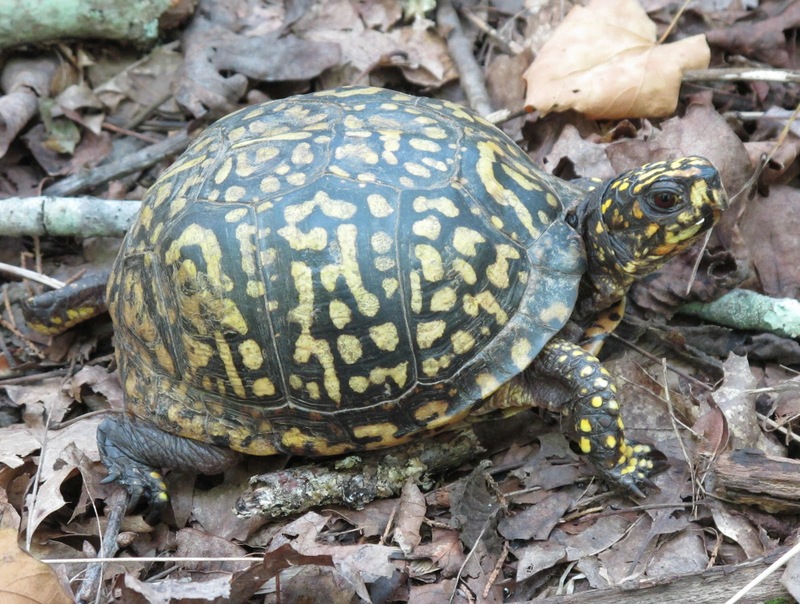 These adults will overwinter in the leaf litter at the base of the plants and will emerge next spring to mate and begin new colonies. I hope to always have a nice patch of Giant Ragweed for their use. 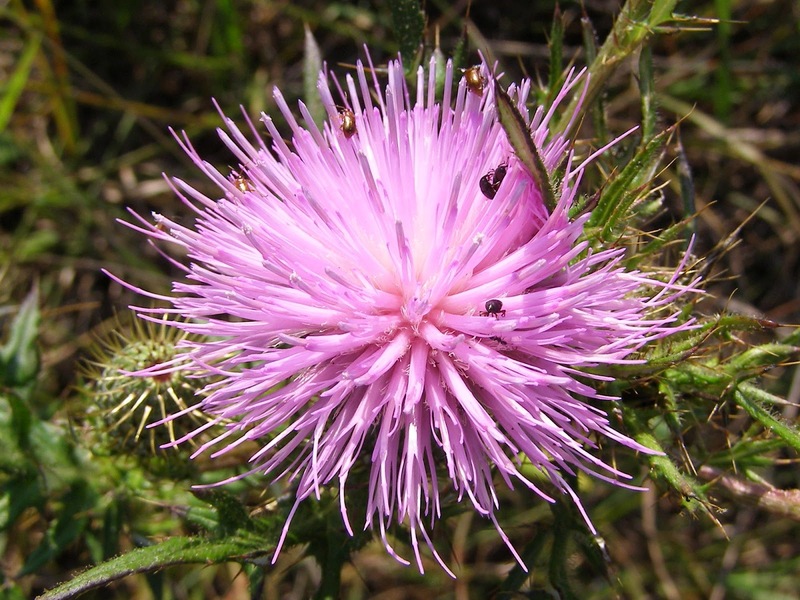 This is the time of year to enjoy the lovely blooms of the tall native thistles. These gangly giants can reach a towering 9 feet tall and produce dozens of separate flower heads. Each bloom is like a starburst fireworks display. The pictured creation was produced by the common Field Thistle, Cirsium discolor. 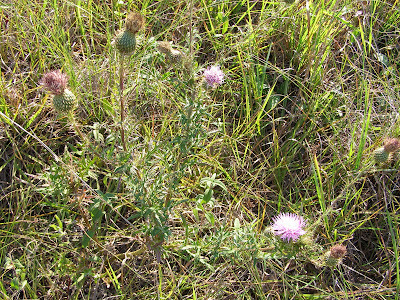 Like many other plants of the prairie, Field Thistle failed to live up to its expectations this year. At 24 inches tall, this plant barely makes it above the surrounding grass. The effects of an early season drought continue to be demonstrated by the short stature of normally tall and robust plants. Field Thistle is usually a short lived perennial plant in this area, so it began its growth by using root stored energy from the previous growing season. As the leaves developed, the plant was no longer dependent on stored energy and began producing its energy through photosynthesis. The first priority for this newly produced energy is for root growth. 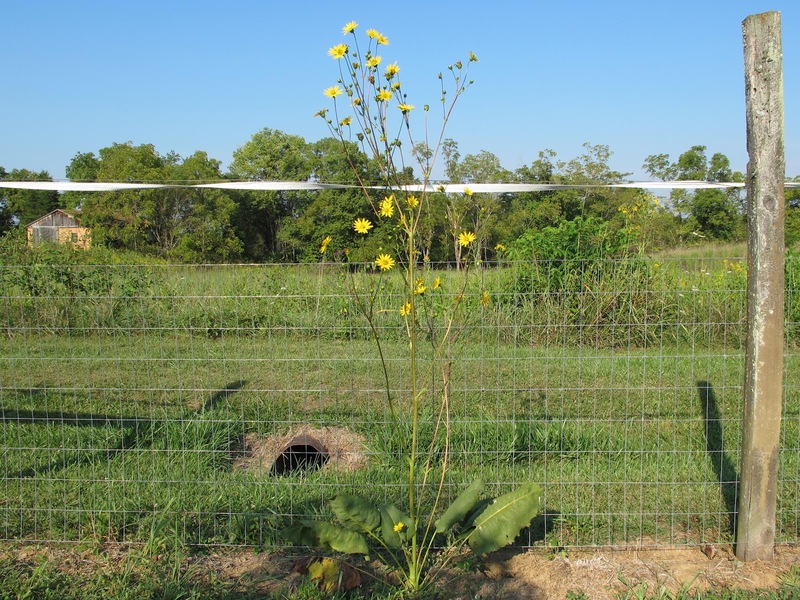 It’s easy to see the cycle of death and regrowth of the above ground portion of the plant. What goes unnoticed is a similar cycle with the roots. 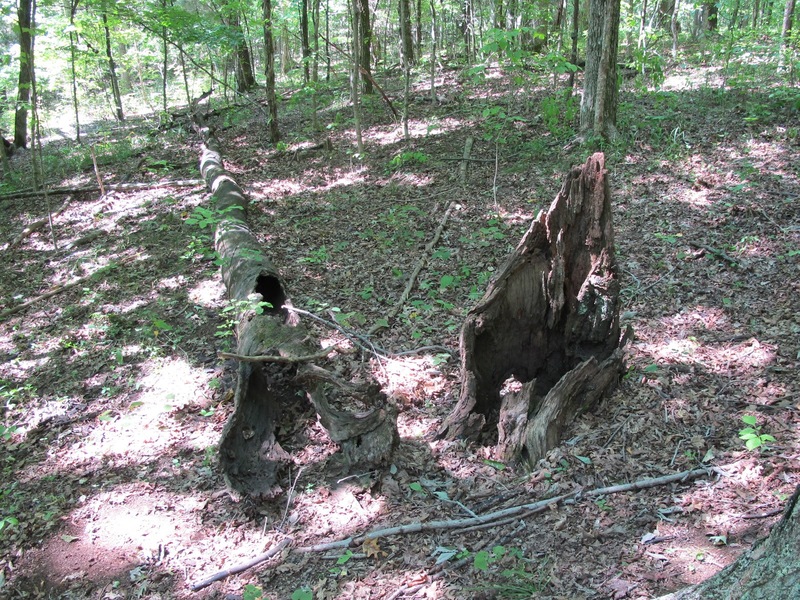 As the growing season progresses, the old root mass declines in favor of fresh new growth. The success of the root replacement process strongly influences that amount of energy available for leaf growth, flowering and seed production. The plant’s priority is to amass a store of energy sufficient to carry it though the coming winter. In extremely stressful years, this may mean no flowers at all. Fewer flower heads means that flower visitors have to crowd in and share the bloom. Most flowers contain a mixed bag of beetle species. 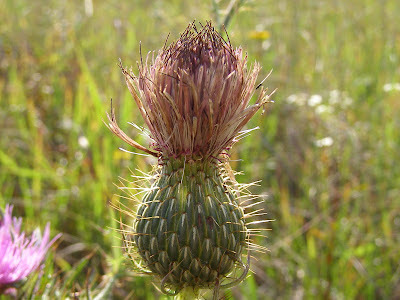 Many people are quick to tag all tall growing thistles as the non-native Bull Thistle. A check of the stem will quickly separate the Bull Thistle from the natives. The stem of the Bull Thistle contains spines, while the native thistles have a spineless stem. 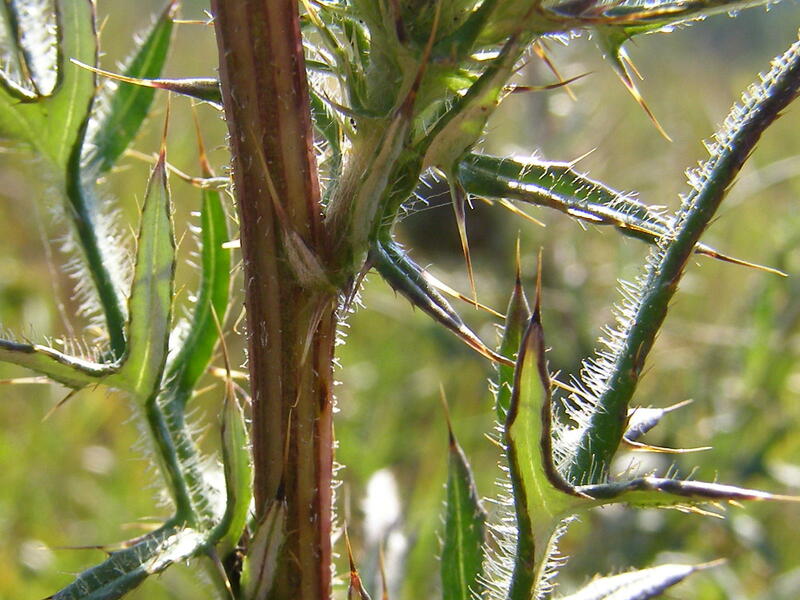 The leaf tips still carry a full arsenal of sharp spines, so it’s best to be cautious around these plants. Even a handful of flower heads will produce a large quantity of seed. Seeds are distributed by the wind, but the birds will take most of them before they are fully ripe. It appears that the fight for seeds will be highly competitive this year. I hope deep, persistent snow cover doesn’t add to the problems related to a diminished seed crop. There are several old hollow logs on the woodland floor at Blue Jay Barrens. This one is a favorite of mine and I stop to visit every time I pass this way. The bark has long since fallen away and the log is the perfect height for sitting. The woods down slope is rather open and this is the perfect vantage point for watching birds work through the tree tops. 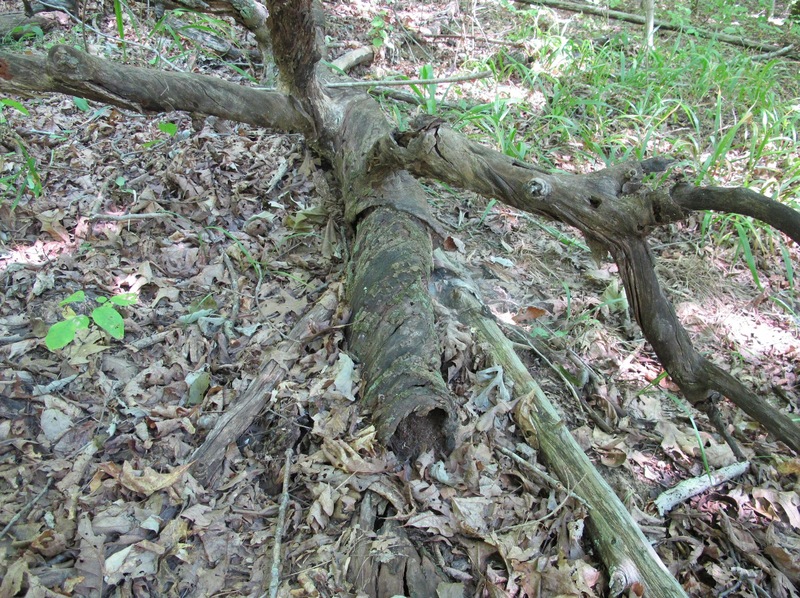 This tree just happened to fall across the slope on a perfect contour and acts as a trap to catch debris moving down the hill. The effect has been very noticeable this year with our alternating pattern of drought and heavy rain. Heavy downpours tend to move down the slope as a solid sheet of water. That runoff water easily transports the dry leaves. 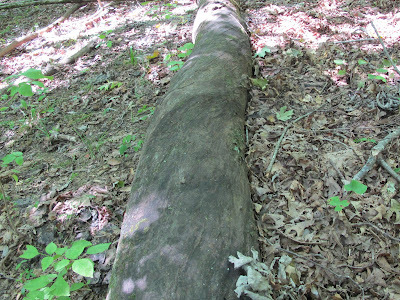 Without obstructions such as this log, those leaves might exit the woods entirely. 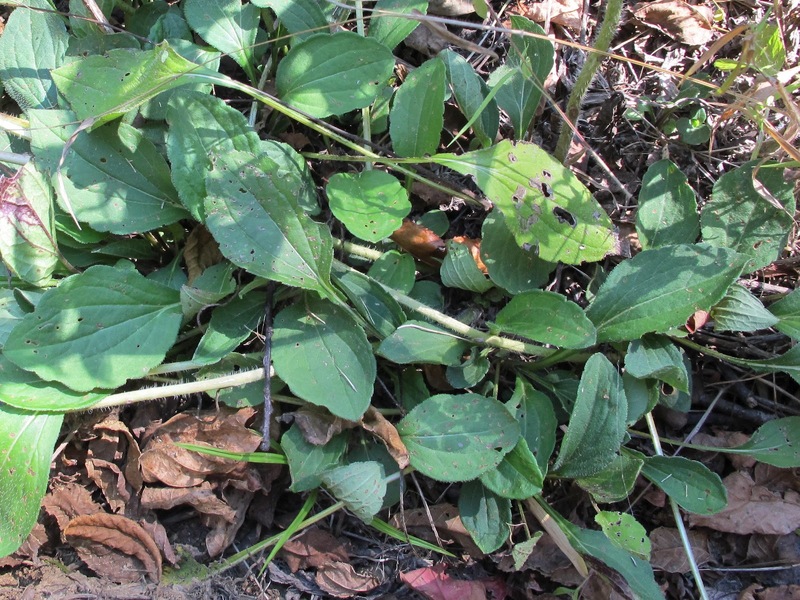 The photo shows a deep collection of leaves on the right side that were caught as they moved downhill. Ground is bare on the downhill side of the log. 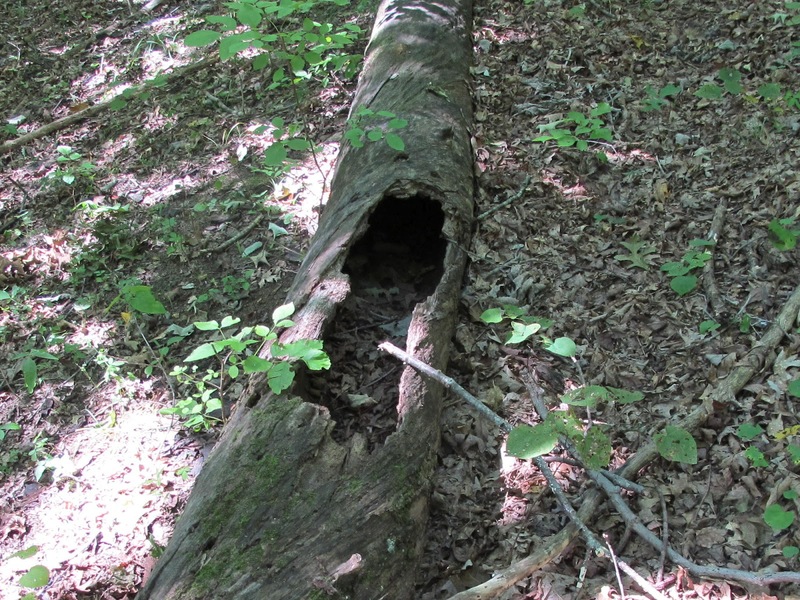 It seems to me that this hollow log would make a perfect home for some animal. I always expect something to come running out when I sit down. The inside seems dry and water tight. I check each time I come by, but spider webs are about the only animal signs I ever see. 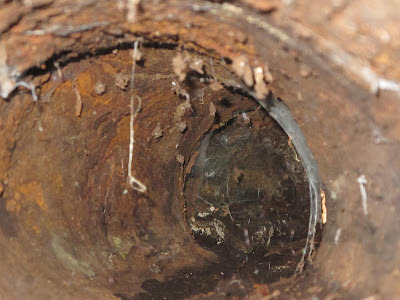 A shot without flash shows what appears to be an exit at the other end of the log. I love using the digital camera to explore where my head and body won’t fit. When I walk down that way, there is nothing but tree top. The tree takes a turn before reaching this collection of limbs, so a hole here wouldn’t line up with the trunk anyhow. I returned to my original vantage point to more carefully examine the scene. 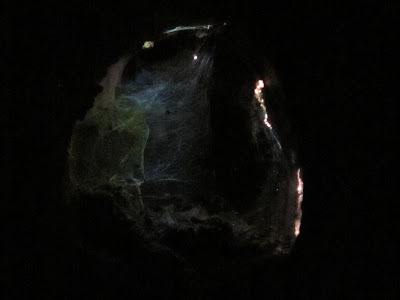 By zooming in on the light, I’m able to see some detail of what I perceived as the exit. 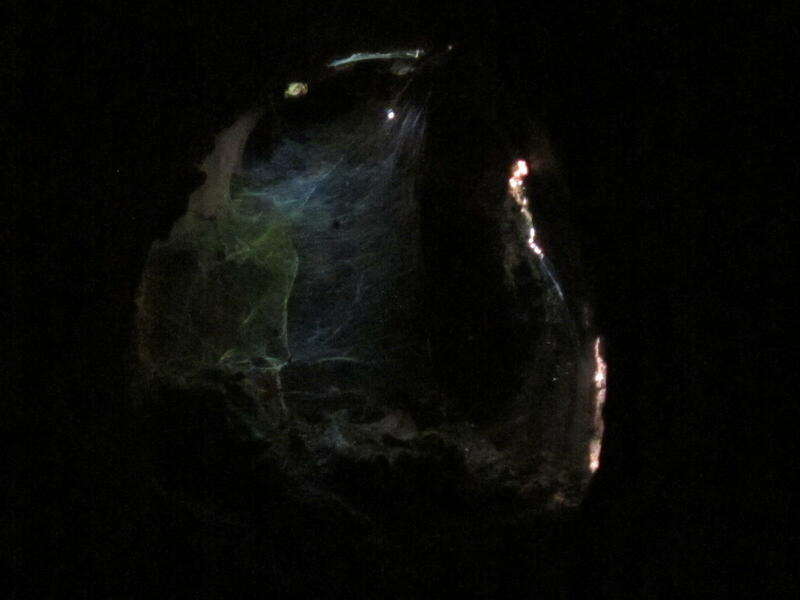 The illumination seems to be coming from above and creating diffused light among the spider webs. 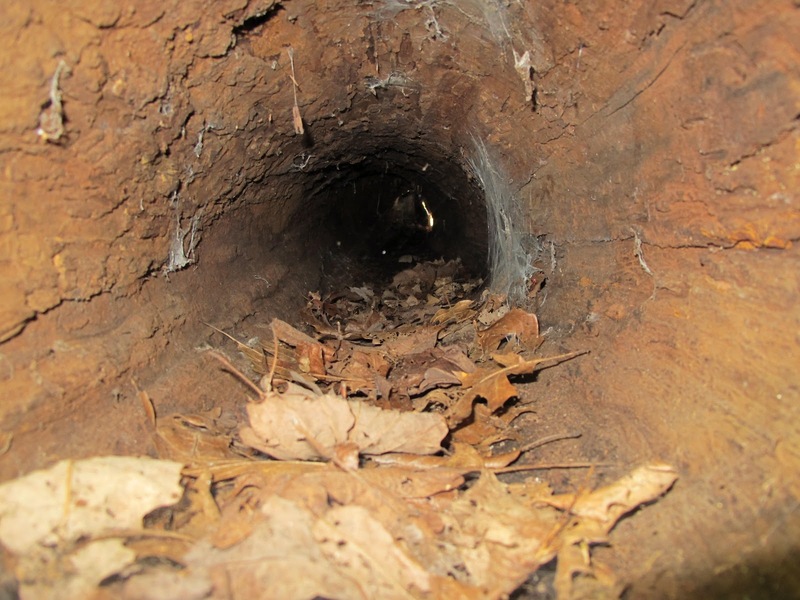 Use of the flash confirms the presence of the webs and shows a water stain left by the rain. 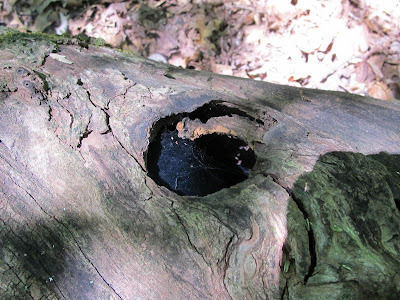 There must be another hole somewhere along the log. About 30 feet down the log I found this hole complete with spider web. The web over the opening was dirty and had obviously been there for some time. Nothing has been entering the log through this hole. Apparently this log is not a safe place to be hiding. I guess any small animal possessing my instincts for safe living quarters would be quickly weeded from the gene pool. The Blue Jay Barrens population of Prairie Dock expands each year. 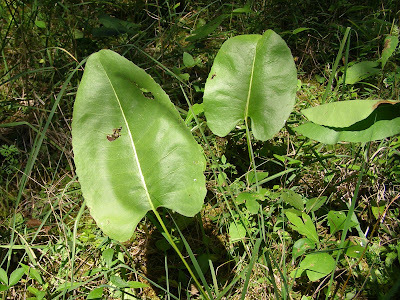 The large basal leaves make it impossible to overlook this species. 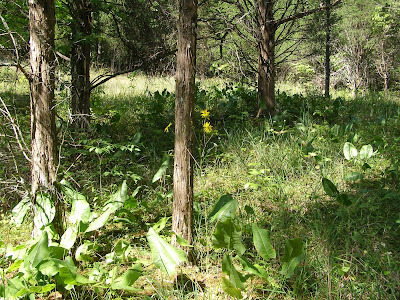 The original area of Prairie Dock was growing in almost permanent shade and was only about 30 feet across. 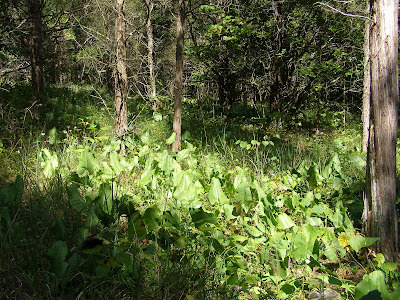 The Prairie Dock spread rapidly after I thinned out the trees to increase the light levels. One to two dozen plants bloom each year. 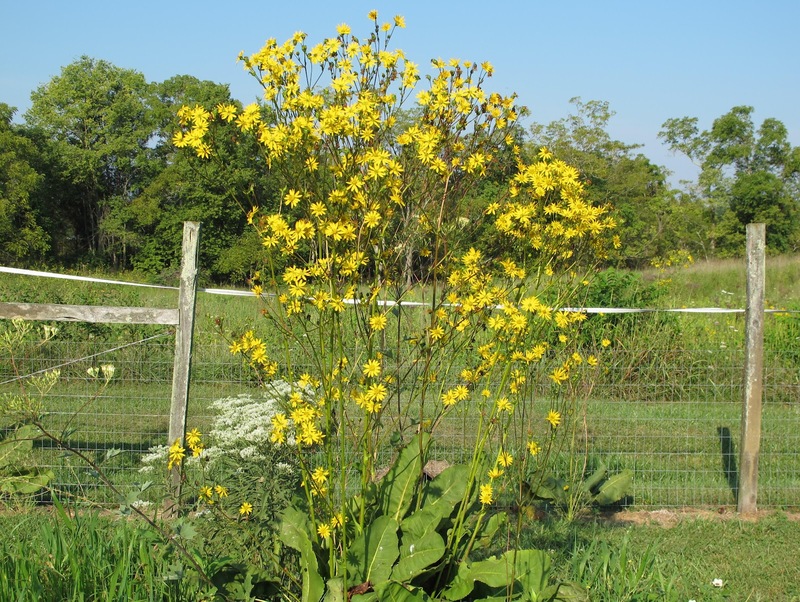 Prairie Dock is generally unaffected by drought conditions. Its roots go down many feet and can easily bring up enough water to keep the plant growing. A problem occurs when bedrock stops the roots a foot or two beneath the surface. 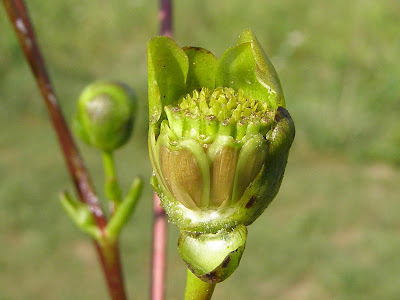 On this site, a rainy year will definitely increase the number of flowering plants. 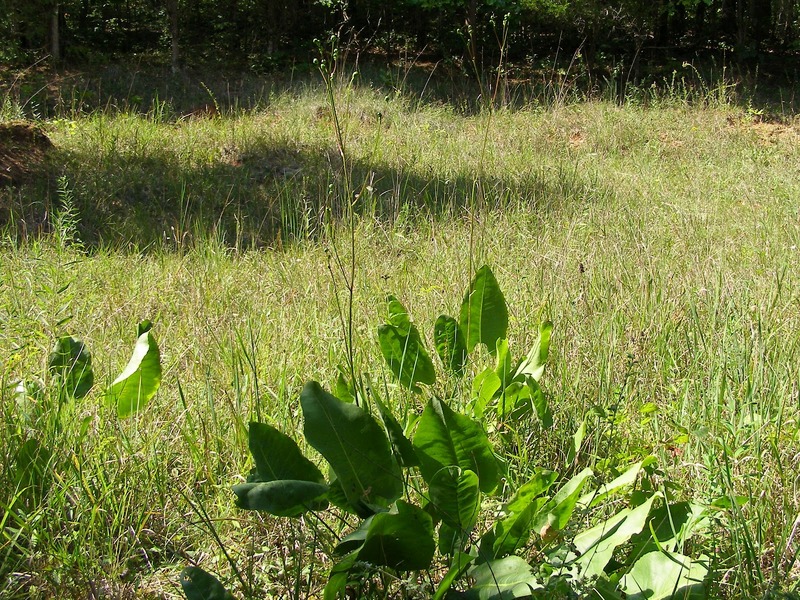 Shade also affects growth of the plants. 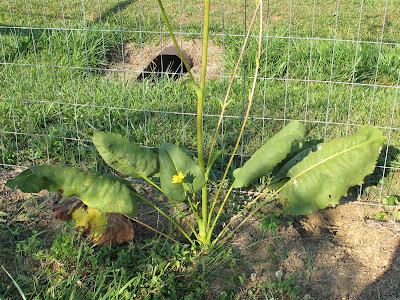 Prairie Dock was quick to spread into newly created partially shady areas. It has failed to expand into the areas receiving full sun. This is normally a plant of full sun and removing additional trees to create a more open habitat would seem the natural management scheme. Since I can’t put the trees back once they are cut, I’ve been slowly thinning trees and evaluating the results. 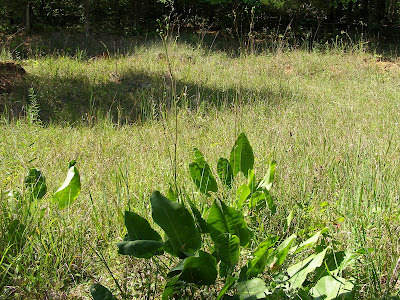 Until I discover why the plants do not spread into the open areas, I’ll allow them to remain in the shade. I do have a few plants that grow in full sun and thrive in that condition. This mass of flowers was produced by some of the more robust plants on the property. I maintain this cluster of plants in my garden. 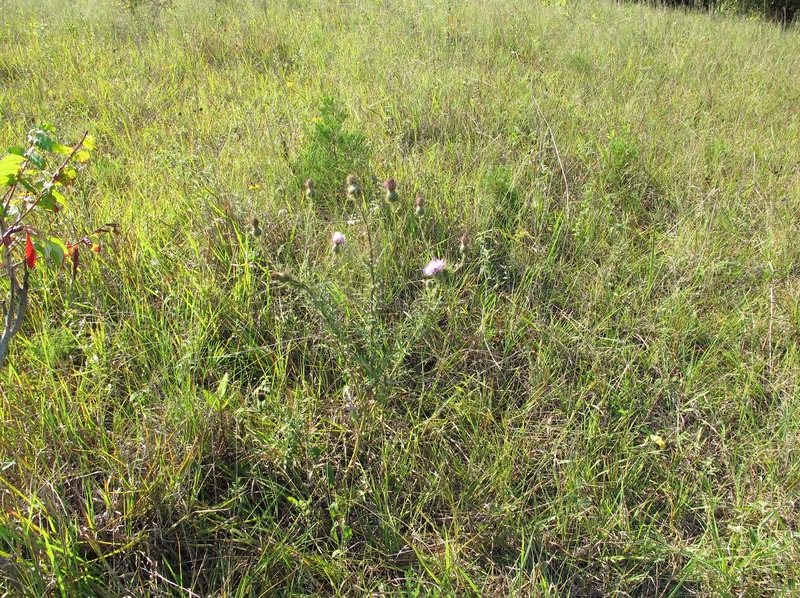 The plants grew from seed produced in the previously described area. Their purpose is to provide me with a source of Prairie Dock seed for reseeding projects. Soil depth in this area is in excess of four feet and provides the plants with conditions much superior to those at the natural stand. Several new plants have popped up in the vicinity of my garden plot. Most are found in the fence row where birds have dropped the seeds. Finches swarm to these plants and can clean up all of the seed in just a few days. In order to harvest any seed for myself, I must cover the seed heads with netting to keep out the birds. It may be the lack of competition that keeps the leaves on these garden plants shorter and smaller in size. This is a three year old plant that is flowering for the first time. For the most part, these flowers track the sun through the day. The most spectacular view is in the early morning when the sun is still at a low angle. 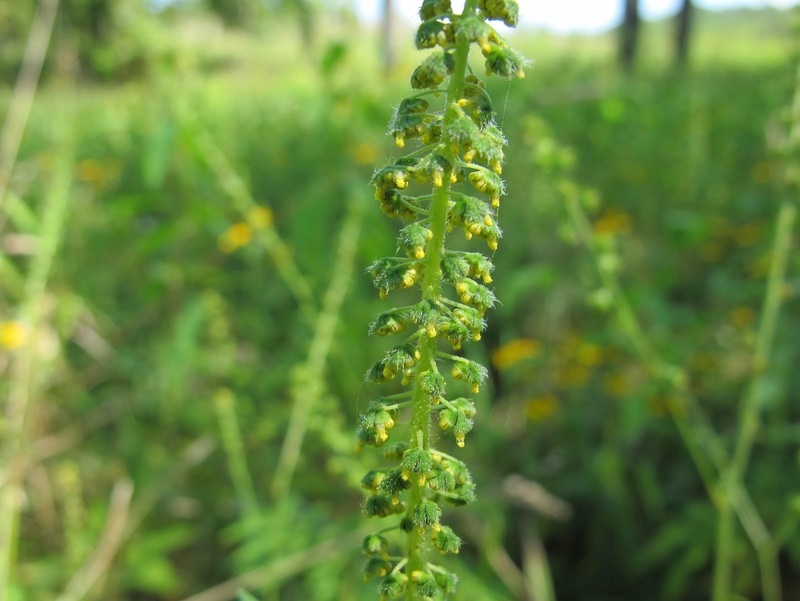 Unlike many composite type flowers, the Prairie Dock flower does not produce seeds across the entire seed head. 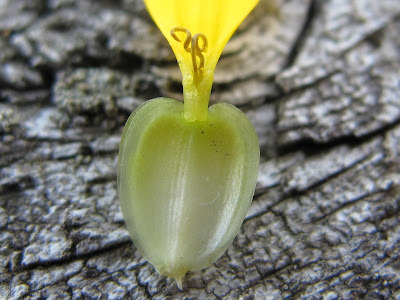 The tubular flowers in the center of the disk are incapable of producing seed and serve only to produce pollen. 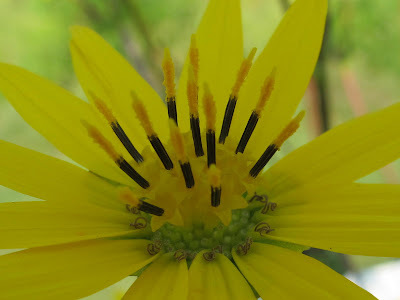 Seeds are produced by the ray flowers located at the base of the yellow petals. 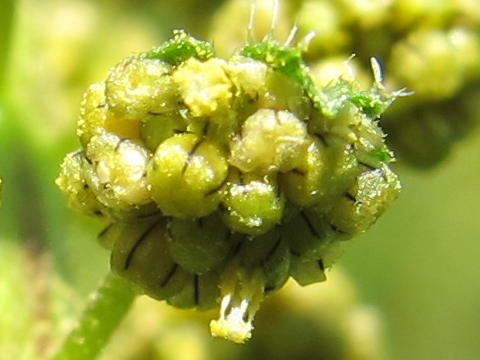 In the photo, the candlestick shaped flowers are the pollen producers and the brown curls indicate the location of the seed makers. The brown curl is the stigma that receives the pollen. Newly produced stigmas are yellow-green in color and turn brown after pollination. Peeling away the phyllaries exposes the ovary in which the seed will develop. The mature fruit is known as an achene. Here is an individual ray flower with attached ovary. The achenes mature rapidly. These will soon be attracting the finches. The birds are often able to extract all of the achenes without disturbing the rest of the seed head. It can be quite disappointing to begin seed collection only to find the birds have already cleaned everything out. 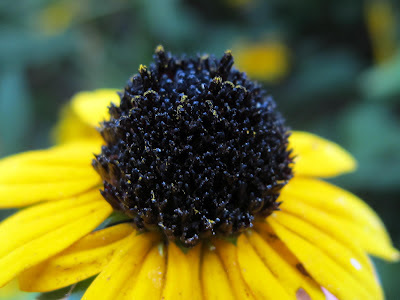 Most petals showed signs of being fed upon, but I saw very few insects. 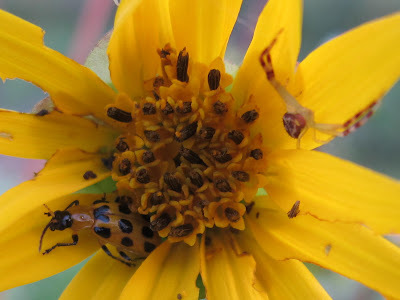 I found another Spotted Cucumber Beetle, this one yellow. 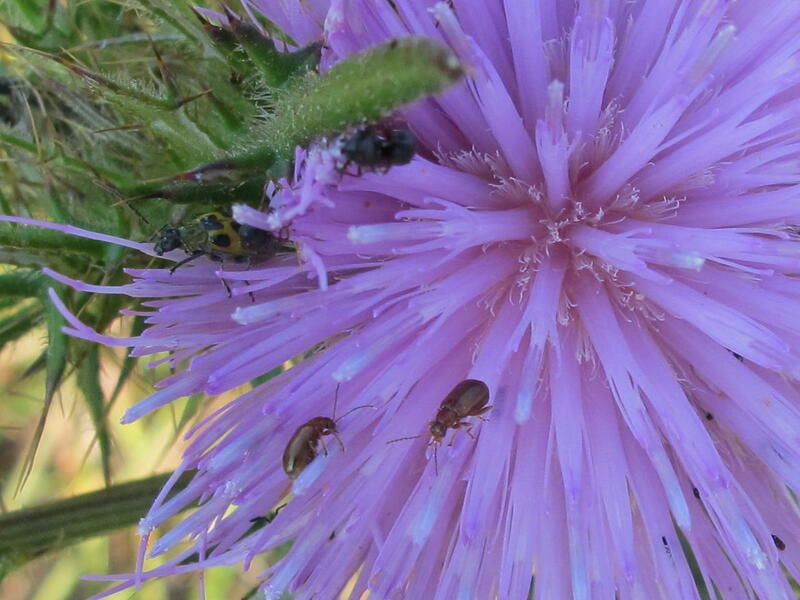 It was sharing the flower with a small Crab Spider. The most interesting plant eater was this Stinging Rose Caterpillar working away at one of the big Prairie Dock leaves. 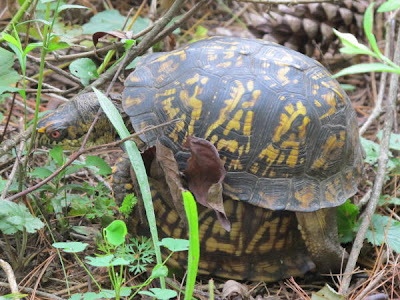 I don’t often find mating turtles, but this is the second pair I’ve seen this month. Their breeding season runs from mid-spring, through summer and into mid-fall. I’m not sure I would describe that as an actual breeding season. 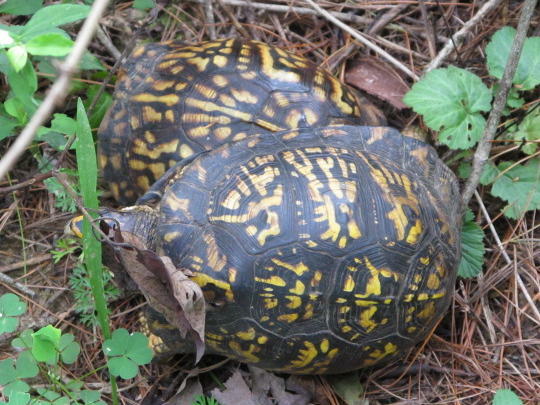 It seems that they are liable to mate anytime they’re not hibernating. By the time I spot a turtle pair, they’ve already seen me. The typical result is for the male to lose his balance and end up on this side. 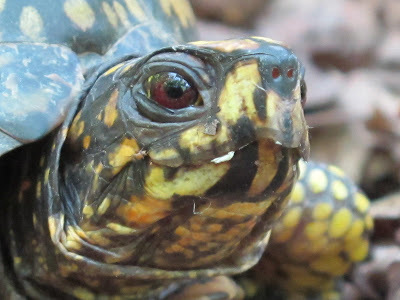 Eastern Box Turtles use no mating grounds or special calls or scents to aid in finding a mate. They have to take advantage of chance encounters. Fortunately, females can produce fertile eggs for several seasons after a successful mating. This pair was still in the preliminary stages, so I backed away and gave them some privacy. I hope to be seeing some of their offspring next year. About one hundred feet into the woods from the mating pair was a third turtle. This female was moving away from the pair and has no connection to them other than being of the same species. I particularly liked her facial markings. She appears to have been painted up for battle.